Victory | The Dacorum Heritage Trust Ltd.
DACHT : 62.12.12. 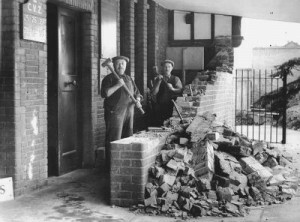 Demolition of the anti-blast wall outside the Time Office, at John Dickinson’s. DACHT : 1391.3. 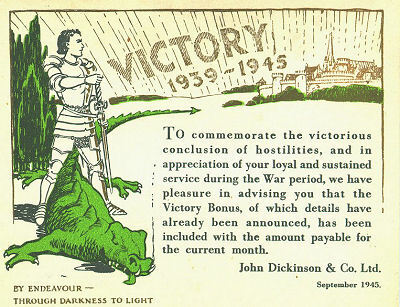 This card was given to John Dickinson employees to commemorate the victory and stated that a ‘Victory Bonus’ would be paid. 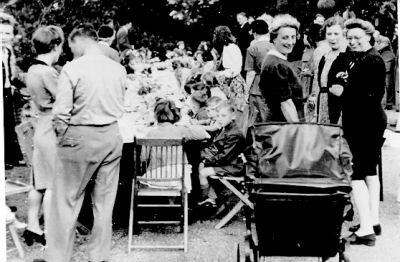 On 7 May 1945, Germany surrendered and the war in Europe was over. 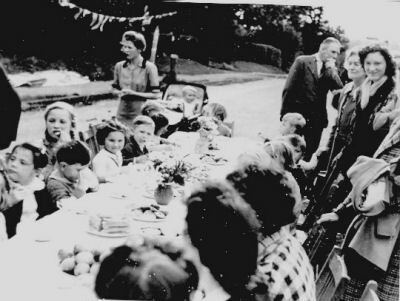 Two days of national holiday were announced and the following day was declared ‘VE Day’ (Victory in Europe). The initial celebrations were spontaneous as people danced in the streets. Although the official end of the Blackout was not until 15 July, bonfires were lit and one at Wigginton could be seen for several miles. 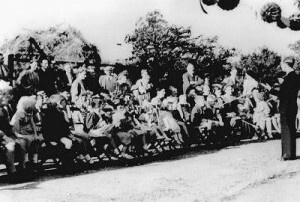 A captured Nazi flag was laid across the road in Berkhamsted for people to drive and walk over and another one was set alight in Nash Mills, Hemel Hempstead. Thanksgiving services were held and church bells were rung. The bells of the parish church at Kings Langley were rung by four of the bellringers who had performed the same duty at the end of the First World War. The bells of the St Mary’s Church, Hemel Hempstead, rang from 2.00pm to 5.00pm on the second day of the national holidays. On 6 August, the United States of America dropped the first nuclear bomb on the Japanese city of Hiroshima. The Japanese surrendered three days later, when a second bomb destroyed Nagasaki. ‘VJ’ (Victory over Japan) was celebrated on 16 August, but the mood was rather quieter. A number of organised events were held in September and October to celebrate both VE and VJ Days. A year later, in May 1946, the Government announced that it was to spend £380 million on creating 20 new towns, which would house one million people. One of these towns was Hemel Hempstead.